Introduced in the late 1940’s, network television entered its first “golden age” in the early 1950’s, as the young medium began developing its own stars. Because of countless reruns, and through the magic of kinescope footage, many of those performers are still well know to this day. But unlike Lucille Ball, Jackie Gleason and Milton Berle, a man by the name of Tim Moore remains almost forgotten, despite appearing in a classic sit-com, and his status as the first African-American male to star on a network television series. There are two main reasons why Moore has been relegated to obscurity. First, Tim Moore has been deceased for over 50 years, and second, almost none of his work is currently shown on commercial television….Moore’s sitcom, “Amos and Andy” has not been available in syndication since 1966, and thus Moore’s brilliant portrayal as George “Kingfish” Stevens is now a faint baby boomer memory. Born Harry Roscoe Moore in Rock Island, Illinois on December 9, 1887, Tim Moore entered show business at the age of 10, dancing in a vaudeville act known as “Cora Miskel and Her Gold Dust Twins.” Over the next few years, Moore drifted between jobs, working for circuses, medicine shows and race tracks, even becoming a boxer under the name “Kid Klondike.” By the 1920’s, Moore had returned to the stage full-time, performing comedy in various shows that had brief Broadway runs. In addition to becoming an established comedian, Moore dabbled in writing material for other performers, including W.C. Fields. Tim’s first major success was as the star comedian in the hit musical revue, “Blackbirds of 1928,” which also featured famed dancer Bill “Bojangles” Robinson. Moore repeated this role in several later “Blackbird” revues, the 1939 version introducing Lena Horne as the principle singing star. In the early 1940’s, Tim Moore established himself as one of the top comics working Harlem’s Apollo Theater, taking time out to accept dramatic roles on radio. As television gained a foothold in America in the late 1940’s, Moore was an occasional guest on Ed Sullivan’s variety show, then known as “Toast of the Town.” It can easily be said that despite his obvious talents, being an African American denied him any significant mainstream success. Nearing the age of 60, Moore left show business and settled in his home town of Rock Island, working a night shift at the Servus Rubber Company. At this point, Moore had no reason to suspect that his biggest role was still ahead of him. In its original format, “Amos and Andy” was a weekday, 15 minute show that featured a slowly moving storyline, much like a soap opera. Amos Jones and Andrew H. Brown, a pair of Georgia farm workers, had moved to Chicago, where they founded the Fresh Air Taxi Company. While Amos drove the company’s only cab, Andy was usually hanging out with the man who eventually became the show’s dominant character, George “Kingfish” Stevens. The “Kingfish” was the leader of the “Mystic Knights of the Sea” lodge, and was usually trying to lure Andy into some kind of dubious get-rich-quick enterprise, unless he was trying to trick Andy directly. 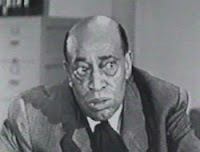 Andy’s dialogue was handled by Charles Correll, while Freeman Godsen spoke both Amos’s and Kingfish’s lines. During “Amos and Andy’s” original radio run, Godsen and Correll portrayed over 170 different characters, only using outside actors for female roles. “Amos and Andy” was an immediate hit in 1928, both in Chicago and throughout the nation, thanks to a syndication deal that distributed the program to over 70 stations. The show’s success attracted the attention of the NBC network, which placed “Amos and Andy” on its Monday through Friday schedule on August 19, 1929. At this time, the show’s central characters were relocated to New York City’s Harlem, where Andy became involved with a beautician named Madam Queen. The story arc concerning Andy and Madam Queen’s romance, and subsequent fallout was heard by over 40 million nightly listeners during 1931 and 1932. It’s impossible to discuss “Amos and Andy” without mentioning the controversial aspects of the program. There is no doubt that much of “Amos and Andy’s” humor relied on racial stereotyping, particularly in terms of what was described as “crude, repetitious and moronic dialogue.” Godsen and Correll didn’t help matters by disguising themselves as African Americans in publicity photos, and making the regrettable decision to appear in blackface for a 1930 motion picture version of the show, called “Check and Double Check.” Despite objections to “Amos and Andy” by various Black groups, the show was remained the top rated radio program for several years, perhaps due to the lack of political or financial clout by the African American community in the 1930’s. In 1951, Godsen and Correll partnered with CBS to bring “Amos and Andy” to television by way of a weekly 30 minute sitcom. Not wanting to repeat the mistake putting Godsen and Correll in blackface, the show went with an entirely African American cast, a television first. Alvin Childress and Spencer Williams Jr. were given the title roles, while Tim Moore was lured out of retirement to play the “Kingfish.” “Amos and Andy” made its network television debut on June 28, 1951. Although the show pulled very good ratings, African American groups did not like the TV version of the show any more than they did the radio show, and began protesting against the show beginning with the very first episodes. “Amos and Andy’s” principle sponsor, Blatz Beer, withdrew its advertising from the program in 1953, and so “Amos and Andy” was canceled after two seasons and 70 episodes. The show enjoyed a second life in reruns, but pressure from the NAACP resulted in CBS withdrawing it from circulation in 1966…”Amos and Andy” has not appeared regularly on television since. Regardless on how one feels about the content of “Amos and Andy,” there is no doubting Tim Moore’s excellent, over the top performance as the “Kingfish.” With his loud baritone voice, and priceless facial expressions, Moore was equally effective playing the scheming con-man with Andy, as he was being the henpecked husband with his wife Sapphire, played by Ernestine Wade. Special mention should be given to Johnny Lee for his hilarious portrayal of the shifty lawyer, Algonquin J. Calhoun. I would like to see Tim Moore receive his due as a comic actor. Note: In discussing Tim Moore’s career as a prizefighter, some sources have listed boxing greats Jack Johnson and Sam Langford among his opponents. This is probably because Moore’s ring name, “Kid Klondike” is similar to another fighter known as “Klondike,” who actually did meet Langford and Johnson. That fighter’s real name was John Haines. Haines/ “Klondike” first faced Jack Johnson in 1900 when Moore was still 12.